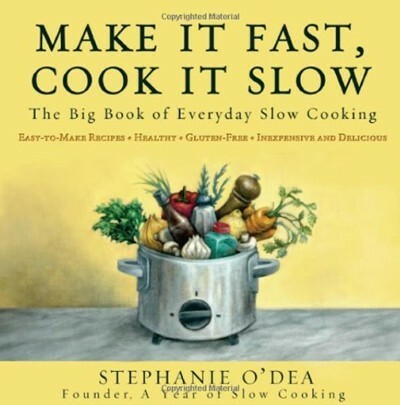 This book is great for easy slow-cooker dinners that require very little prep. It truly is an "everyday" cookbook as the subtitle claims. Some recipes need a little tweaking if I were to make them again -- in particular most recipes tend to not call for seasoning with salt and pepper which I find a little odd, but easily fixable. Most recipes I've made so far could benefit from a little seasoning, so I will likely do so for new recipes I try in the future as a general rule. Still, the dishes are solid and there is a nice variety to choose from. As a new mom who doesn't have a lot of time to cook, but still wants to get some semblance of dinner together this book has been really great. I have many more recipes bookmarked to try including some using pantry/freezer ingredients that don't require another trip to the store which I know will come in handy! Made this with quick cooking oats and craisins. Delicious!! Cooked in about 3 1/2 hours. Nice traditional stuffing. I did use the brown rice bread as suggested and it worked well. I did not need the extra broth as the bread at the bottom was a bit soggy. I also used less sage as our family is not a fan. This recipe was simple and delicious. I found it to be just a little dry so added one extra can of tomato sauce. Also, had some left over mini bars of dark chocolate from Halloween and added a couple toward the end of cooking. I think they added a little extra flavor. This was so good! I cooked it on low and for 6 hours. I used only 1 cup of quinoa, so adjusted the chicken broth to 2 cups. I left the seasonings as is though and it came out very well. Since I didn't have unsweetened dried cranberries, I opted for dried apricots instead because I didn't want anything overly sweet. I didn't have spinach, so I left that out, but I think it would go nicely if I had some on hand. Since I was planning to eat this leftover as well, I added the cheese and tomatoes fresh each time right before serving, instead of all at once. The cheese and tomatoes really do make this dish shine and I would definitely make this recipe again. This was a tad spicy for me because the chili powder I currently have has a high proportion of cayenne (which I forgot!). I added a scant 1/2 tsp salt to the cornbread batter and I only used 1 Tbsp of sugar. I also substituted a scant 1/4 cup of dehydrated shallots for the onion. A good dish, but I'm not sure I will repeat it -- it makes quite a bit if it is mostly me eating the leftovers (my husband isn't the biggest fan of beans.) I cooked it 7 hours on low, though it could have been finished at 6. I opened the lid at 6 and wiped up the excess condensation and then let it go another hour. I was skeptical the cornbread would brown up, but it did quite nicely. Additional note: This really isn't great leftover. It was OK the next day, but the cornbread really didn't hold up well. After that, I turned some of the leftover filling into tacos with some cooked chicken and cheddar which were great. I love leftovers, but I couldn't eat it another day without turning it into something new. I made this for dinner and it was easy and very tasty. I added a little poultry seasoning towards the end of cooking. Pretty good, but I wouldn't make this again. The amount of turmeric was a bit overpowering for me. My husband and I both thought this was excellent (a home run!) I omitted the mustard and used shallot flakes instead of onion flakes, but otherwise made as directed. The sauce is flavorful and the chicken is fall-apart tender. Took less than five minutes to assemble, so I will definitely be making this again. Served with rice and veggies or salad. I didn't marinate the chicken overnight, but I don't think it was detrimental to the dish. I loved how the onions cooked down, almost caramelizing. A good dish, but not particularly memorable. As written, this recipe is pretty tasteless and definitely needs seasoning. I stirred in approx. 2 tsp chilli powder, 1/2 tsp cayenne pepper, 1 tsp kosher salt, and 1-1/2 tsp garlic powder before serving. I made this recipe with 1-1/2 lb duck breasts and half the marinade instead of a whole duck. I knew it would need less time to cook, but reached the required temperature even faster than I expected. By about two hours (possibly less), it was already well beyond where it needed to be. I would have switched to the warm setting sooner, but had stepped away thinking I didn't need to check it quite yet. It was a little overdone, but still tasty with the marinade which I separated out from the (copious) fat that rendered out. Next time, I will monitor more closely to come up with a more precise cooking time for this recipe with my duck breast substitution. Not a new favorite, but this was pretty good. Very easy to assemble earlier in the day and leave to cook. My husband and I agreed that it needed a little more spice than just what the canned tomatoes with chiles provides -- maybe a tablespoon of Sriracha if I try it again. Also, it does benefit from some salt and given how much liquid there was in the end, I don't think the 1/4 cup water was really necessary. For some unknown reason this came out very dry the first time around. I shredded the leftover pork and served it over jasmine rice which was much better. I like tart cranberry sauces, so left out the white sugar, using only the brown sugar. Skipped the raisins and used an unsweetened berry juice blend instead of straight cranberry juice. Quite good, but not my favorite pork slow cooker recipe. Delicious! Definitely will do again. These were good, but not particularly memorable. They were very quick to prepare since everything just gets mixed together in the slow cooker without any extra prep or steps. I made the suggested variation using chicken instead of beef. The vegetables pretty much disintegrated though. I'm not a huge beef fan, but threw this in the slow cooker for my husband one night when I had something else leftover for myself to eat. He enjoyed it over rice and ate the leftovers (always a good sign!) I used only 3/4 pound of beef and there were a lot of onions in proportion since the recipe actually called for 1-2 pounds. I used 2 tsp of ground ginger in place of fresh and overdid it a bit on the black pepper considering I used a smaller amount of meat -- I would be a little more careful next time. I also seasoned the mixture with a bit of salt. The garlic gave a good flavor and aroma, but my husband didn't actually eat the garlic cloves. Still, a successful easy meal that I could make again. My husband and I enjoyed this dish and it has a really nice flavor. I am very glad I decided to omit the brown sugar as it is definitely not needed. My husband thought it was almost too sweet as I made it and I used Polaner All Fruit Spread (sweetened with fruit juice instead of sugar -- a 10 oz jar is exactly the 1 cup you need, by the way) and mandarin oranges in fruit juice instead of syrup. The recipe tells you to include the juice from the mandarin orange can, but I would omit it next time to try and get a thicker sauce. The juices were very flavorful, but not really the consistency of a sauce. I've made this more than once -- a new family favorite for sure. I omit the brown sugar -- the sweetness from the ketchup is sufficient for us. Easy and tasty, but probably won't repeat. Used canned pineapple instead of frozen. A good dish, but made much more than I was expecting -- we had a LOT of leftovers.